Physical Description: Males average a 122 cm carapace (shell) and weigh 120 kg while the females average a 91 cm carapace and weigh 159 kg. The thick carapace is brownish gray and highly domed . The head is narrowly pointed with a convex forehead. The tail, head, neck, and limbs are gray. Males have larger and longer tails than the females. General Information: Among the tortoises, this species is second only in size to the slightly larger species found on the Galapagos Islands. Life Span is believed to surpass 100 years. 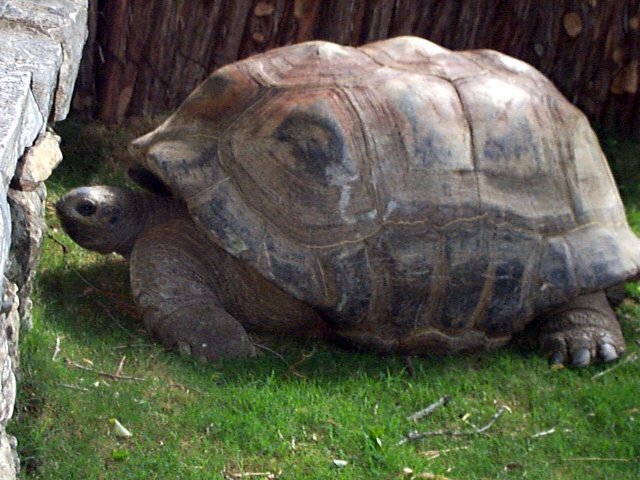 It is believed that tortoises are the longest lived of all animals. Belonging to the class reptilia makes it cold-blooded; standing water is limited so the tortoise relies heavily on metabolic water and water in its food. It digs burrows to stay cool and stays in the shade during the hot weather. Reproduction: Sexual maturity is determined by size rather than age. Most begin to reproduce when they reach approximately half their eventual size. Mating takes place from February to May. Eggs are laid in a shallow nest. females lay between 9-25 eggs of which less than half are fertile in a low density population. The female may lay several clutches of 12-14 eggs a year. Hatching occurs from early October to mid December. 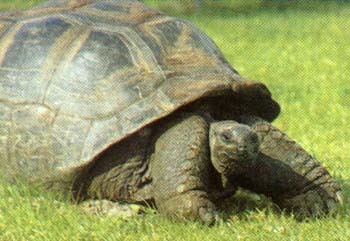 Special Adaptations: Tortoises have been known to knock down over small trees and shrubs to obtain nutrition leaves. A number of woody plants are readily eaten, and some show a conspicuous browse line about a meter above the ground, or as high the tortoises can stretch their necks. They use their necks to reach certain foods. In the case of danger, the turtle is able to pull its body into its thick shell for protection. 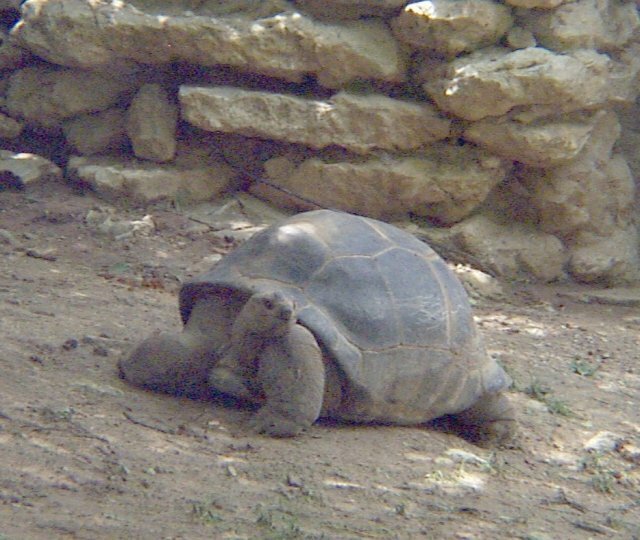 Comments from the Fort Worth Zoo tortoises: They have two tortoises which have been there since the early 1960s. The male weighs over 800 pounds, and during the recent change of environment he had to be moved across the property. It took six large male humans to carry him. Whew! The recent addition of the tortoises' new home makes it accessible year-round. Bobby, their attendant, said that they do not move very fast...unless you wave an apple in front of them. The male mounts the female every summer, but to no avail; she has never produced any offspring.